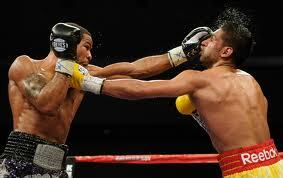 It emerged this week that Lamont Peterson failed a drugs test ahead of his high profile rematch with Amir Khan. With just over a week to go, excitement was building over a fight that meant a lot to both fighters’ careers, but that has been dashed by the events of this week. After the results of the drugs test were made public Amir was quick to take to his media outlet of choice, Twitter, to say how disappointed he was. He then told fans on the social network that the fight was off and that Peterson was to blame, before his promoters finally made things official. Khan pointed out on Twitter that he has worked hard to reach the boxing level he is at in a sporting way, and that being in the ring with someone who has an unfair disadvantage could be dangerous. Khan is hitting on a point that boxing has needed to address for years, and people have been saying for a long time that boxing needs to be stricter on drugs testing. This news leaves boxing fans missing one of the biggest fights of the year, but Khan has said that he will fight on June 30th. There is no solid news on the opponent as yet, but due to schedule clashes you can rule out Mayweather, Pacquiao, Bradley and, of course, Lamont Peterson. There are questions that Lamont Peterson needs to answer here, with the main one being "What the hell were you thinking?" The question most boxing fans will want to know is: "Who will Amir Khan fight next?" *Update* Amir Khan has said on Sky Sports Ringside that Danny Garcia is a possible opponent. In case you were wondering, the substance Peterson tested positive for was testosterone. Boxers use testosterone to help with the intensity of fight training and improve their speed and power.